I’ve probably mentioned my summer in Thailand in Tastetrotting posts past. But I always come back to it as one of those dot-connecting formative food experiences. I was 15 at the time, and I’m not sure what compelled me to ask my parents to spend the summer in Thailand other than that it was really really far away, and likely to require some extreme strategic persuasion. Luckily, I was well practiced at this point in the art of parental manipulation (I’m an only child after all). So I hardly needed to cite character witnesses and evidence, as I’d had to during my curfew appeals process. It was my first trip to Asia, and though I was also well practiced in the art of takeout sushi ordering, Thai cuisine was not something that I’d been exposed to yet on the Upper West Side. Needless to say, I ate my way through the country and came back 5 pounds heavier with a healthy fried-rice-for-breakfast glow. While most people on the program couldn’t wait to get home and eat a burger, I found myself in the weeks that followed craving Southeast Asian flavors like crack. There was one authentic Thai restaurant on Broadway, about 20 blocks from my apartment, called Chandara. It was always empty. But I made a rotating group of my high school friends accompany me there for Pad Thai. Back in the old country, the noodles are served rather plain. You the customer are charged with the delicate task of making it that right combination of sweet, spicy, salty, and sour. Perhaps it was the early chef in me, but I loved being able to doctor my own dish with the lazy Susan of sugar, chile paste, fish sauce, and lime wedges on every table. I especially loved how the sugar would crunch in my teeth when sprinkled over the top of the noodles. Sometime during college (probably right after a Barney’s COOP opened 3 blocks down), Chandara closed. There were many other Thai options now in the area, but all of them had realized how much Americans like sugar, and that the average diner is not the type of weirdo that likes to sprinkle domino packets on their dinner. I couldn’t stand their versions at first, with all that gloppy orange sauce. But eventually I learned to cope, with a few extra wedges of lime. The biggest problem though was that I could rarely find some of the more obscure dishes I loved during my time in Isaan, the area of Northeast Thailand near the Lao border—dishes like Larb. 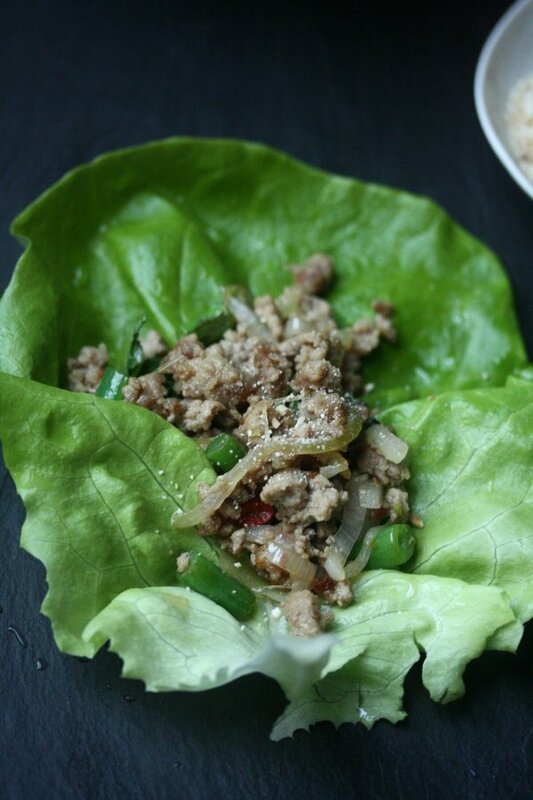 Larb (or Laab/Laap, as it’s called in surrounding areas) is like the Southeast Asian version of a sloppy Joe filling. 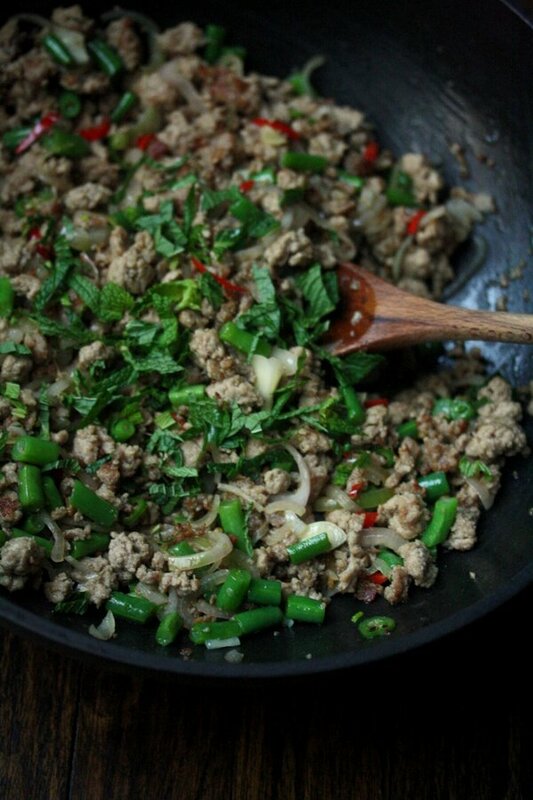 It can be made with any ground meat (sometimes a combination of several) and is packed with chiles and herbs. It’s so spicy most of the time, you’re meant to eat it with a side of sticky rice, gathering a bundle of each in one hand and eating it with your fingers. This was probably my second favorite thing about eating in Thailand, and another faux pas in an American restaurant. The dish gets topped with toasted rice that’s ground into a fine powder. This is often the thing that’s missing from American versions, and it’s one of those flavors that you can’t put your finger on until you realize it’s missing. Recently, there’s been a whole Southeast Asian renaissance in the hipster restaurant scene. 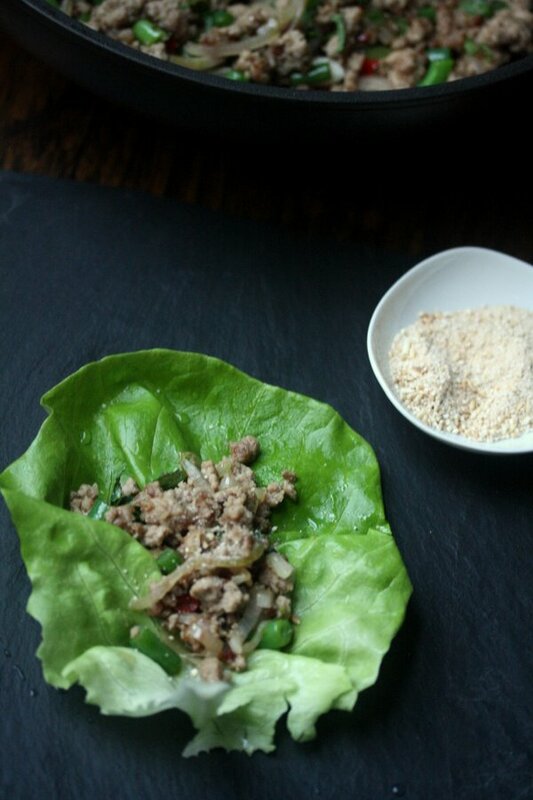 And one of the dishes that’s a frequent menu star is Larb. In the past few months, I’ve eaten duck larb at Kin Shop, tartar laap at the Laotian spot Khe-Yo, and lamb laab at Uncle Boons, where I’m pretty sure I licked the plate and subsequently thought Charlie might never want to share a meal with me again. Shockingly though, I’d never tried my hand at making larb at home until last month, when I worried that I had kicked up my old teenage addiction for Thai food. My version, without the proper chiles, was not as good as the restaurant versions I just mentioned. But it was perfect for a quick fix, especially in a lettuce wrap, which makes eating with your fingers much more acceptable in the presence of others. For more of my favorite Thai recipes, taste trot over here. 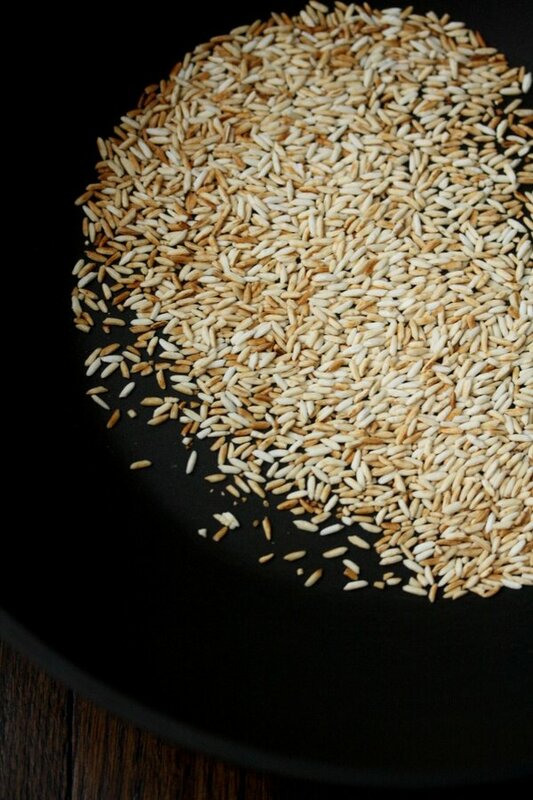 In a large non-stick wok or skillet, toast the rice over medium heat until golden brown, about 3 minutes. Like nuts, the rice can go from brown to burnt very quickly, so keep an eye on it. Remove the toasted rice to a coffee or spice grinder and pulse until it becomes a fine powder. Set aside. Heat the oil in the skillet. Cook the garlic over high heat until golden brown, 1 to 2 minutes. Add the pork and cook, breaking apart with a spatula, until no pink remains, 5 minutes. Stir in the sugar and chiles and continue to cook until the pork begins to brown, 3 more minutes. Stir in the lime juice, fish sauce, shallot, and green beans and stir fry one minute more, until the vegetables are heated through. Add the herbs off the heat and taste for seasoning. Transfer to a serving bowl and garnish with the toasted rice. 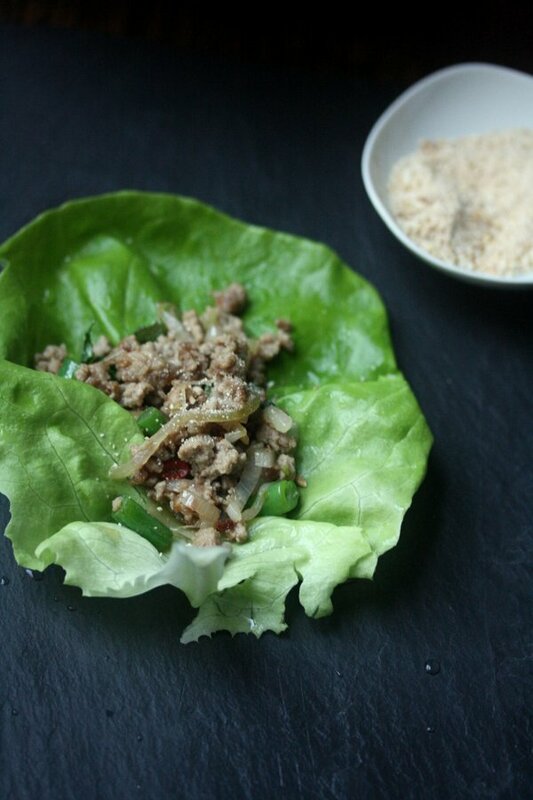 Serve warm alongside the lettuce leaves. The toasted rice might seem like an unnecessary step, but it adds so much authenticity to dish dish. You’ve gotta try them! So easy. I made these ones for a big dinner party and everyone loved them. Ground-up raw rice? That’s a new one. I’m mentally tasting the toasted flavor. No wonder it’s a key ingredient. And I love your story. you toast it first, then grind. it’s delicious! 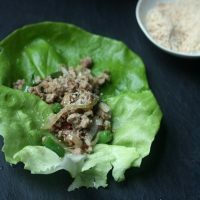 Phoebe, I love larb, and I, too, have never tried making it! I am so intrigued by the toasted, ground rice. I’ve never seen that in a recipe, and I am sure that is going to make all the difference. Fun! Can’t wait to try these — they look so light and healthy and delicious.